How hydroponic systems work may seem complicated at first, but once you understand them, you'll see how they work is actually really quite simple. There are six types of hydroponic systems (Drip System, Ebb & Flow, N.F.T., Water Culture, Aeroponics, and Wick). The plants roots need 3 things, water/moisture, nutrients, and oxygen. What makes the six types of hydroponic systems different is simply how they deliver these three things to the plants roots. Each type of system is described in the detail in the links (by name) to the left and below. 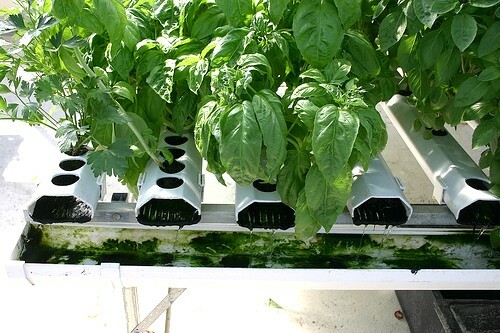 Regardless of what they may choose to call them, all hydroponic systems are based on these six types, and are either one of these types of systems, or a combination of two or more of the six types. There are thousands of ways to make variations, as well as alter any aspect of any of the six types of systems. So once your familiar with how each of the three roots needs (water, nutrients, and oxygen) are delivered in each type of hydroponic system, you'll quickly be able to identify what type of system any hydroponic system is. aquaponics isn't really a 7th type of hydroponic system, simply because what makes aquaponics different is how the nutrients are formulated. Not how the nutrients (or even water and oxygen) are delivered to the roots. The technique of aquaponics and supplying the nutrients from decomposing fish waste can be used in any of the 6 types of hydroponic systems. Simply by replacing the regular nutrient reservoir with a fish tank reservoir. There's a lot more to aquaponics than that because your trying to control specific nutrient levels naturally with microorganisms, bacteria, and micro flora living in the fish water to decompose the fish waste into the nutrients the plants can use. Simply put, aquaponics is a process of making nutrients out of fish waste, basically your making your own nutrients. But that doesn't affect how water, nutrients, or oxygen are delivered to the plants roots. Before building a hydroponic system, it's important to first consider the type of plants you want to grow in it, as well as the space you have to grow them in. Then you'll want to make sure to design the system to be able to accommodate the plants needs (plant size, root size, oxygen to the roots, water consumption, etc. etc.) even after they reach full size. While one type of hydroponic system may be well suited for growing some types of plants, it may not be the best choice for growing others. Some basic things that you want to keep in mind when designing and building (even buying) any hydroponic system are; First, you will probably want to use it more than once, so you should think about things like how hard it will be to break it down and take it apart to clean it thoroughly between plantings. Also, should you have a problem while the plants are still growing, you should think about how hard will it be to fix the problems without doing damage to the plants or system. You can grow most any type of plants in any type of hydroponic system if you design the system to accommodate the plants needs, even when they reach full size. However it still might be easier, take less maintenance, as well as be cheaper to grow them in another type of hydroponic system instead. Also, when growing many types of plants, it's often much better to grow them in different systems designed for those specific crops, rather than trying to grow them all in one large system. The growing chamber is the part of the hydroponic system where the plants roots will be growing. Simply put, the growing chamber is the container for the root zone. This area provides plant support, as well as is where the roots access the nutrient solution. It also protects the roots from light, heat, and pests. It's important to keep the root zone cool and light proof. Prolonged light will damage the roots, and high temps in the root zone will cause heat stress to your plants, as well as fruit and flower drop as a result of heat stress.